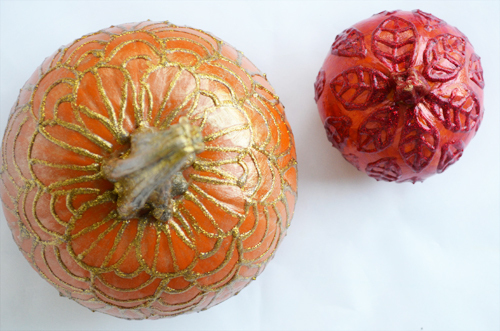 This pumpkin project is one of those that will last you from September to Thanksgiving! 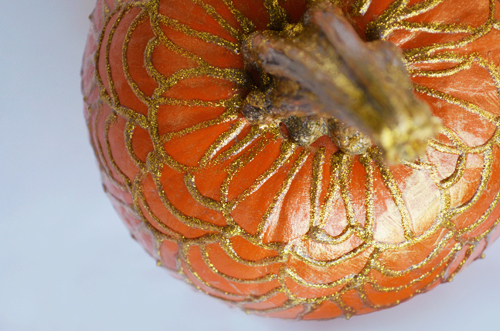 The colors and glitter shimmer just scream fall and all it takes are some of your favorite puffy paint colors and a steady hand. 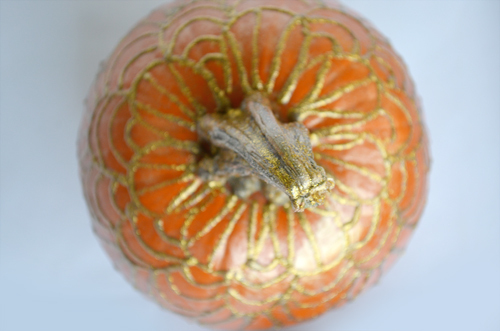 Start off by squeezing some of the Tulip 3D paint in metallic gold onto the pumpkin and stem. 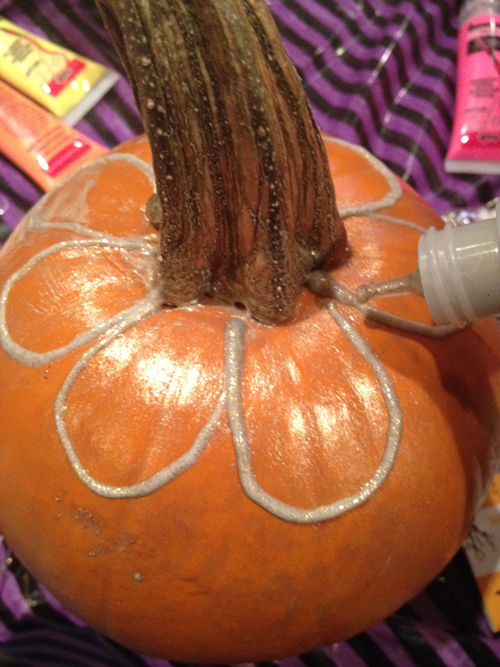 Rub it off with a soft cloth. 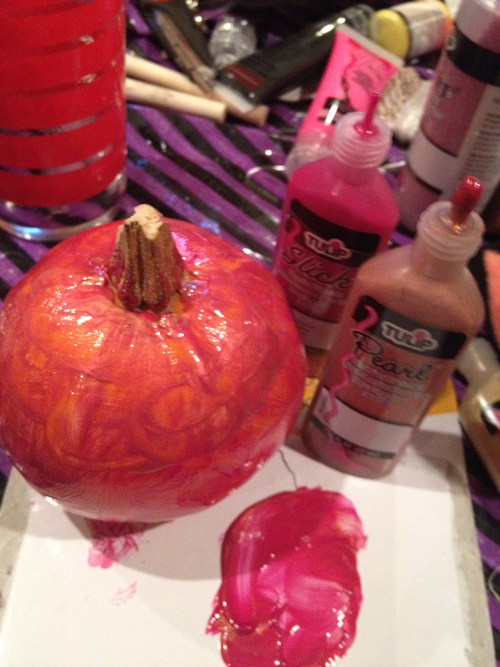 This will give the entire pumpkin a pretty metallic sheen. 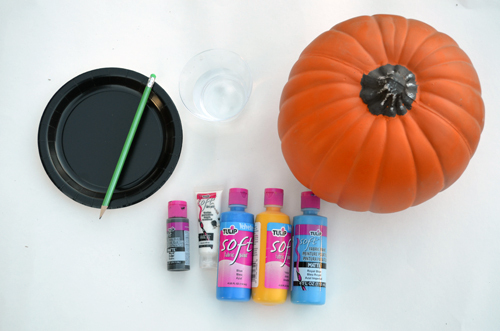 Now make a flower shape on top of the pumpkin using your Tulip 3D Glitter paint. 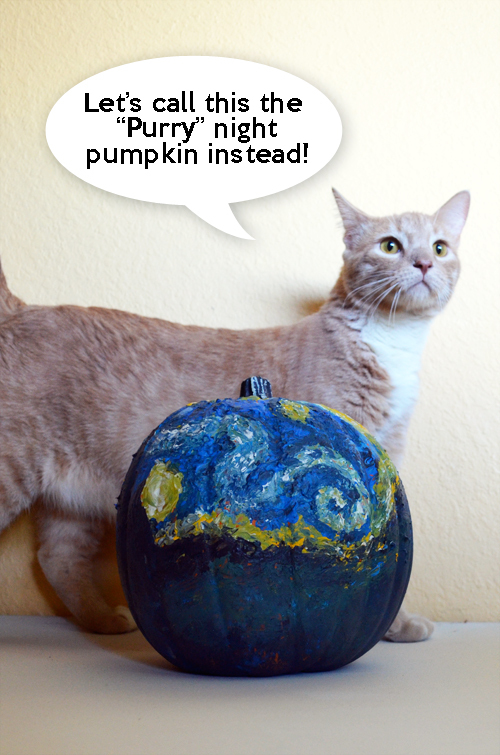 Repeat this over the entire pumpkin. 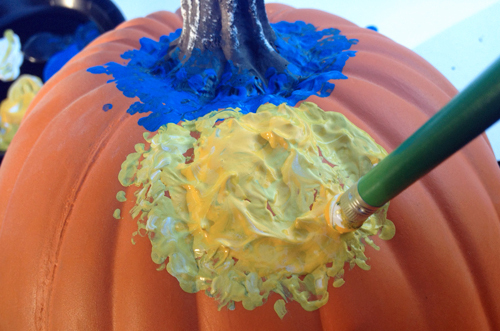 This will create a cool “scalloped” effect on the surface. For added visual drama, I added vertical and horizontal paint strips inside each petal. 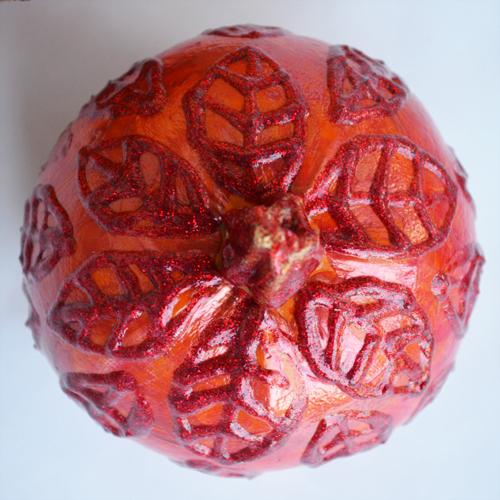 For the red mini pumpkin, I painted it with a coat of copper 3D paint mixed with pomegranate 3D paint. 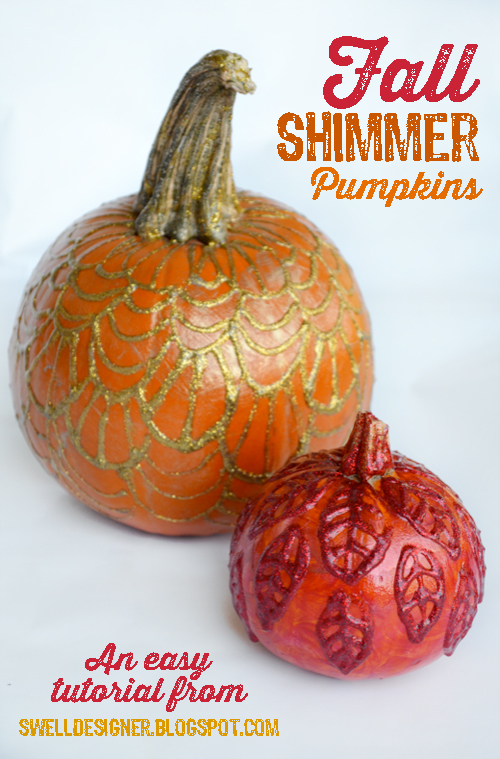 I love adding metallics to add sheen to my paint colors! Here’s some photos of them when they dried. They turned out so shimmery! 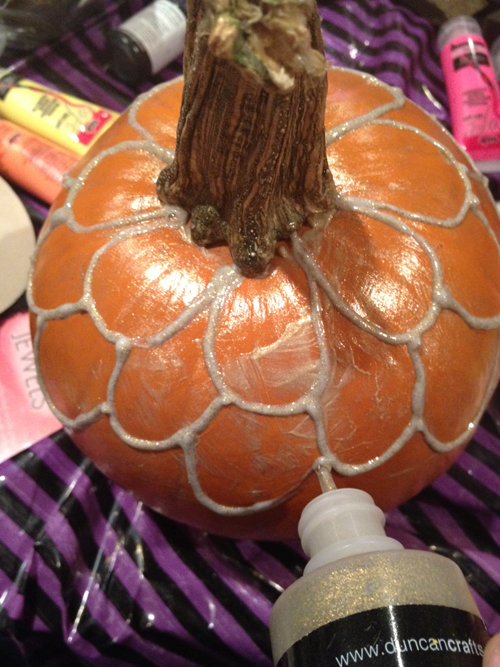 Don’t forget to glitter your stems so they match the rest of the pumpkin! 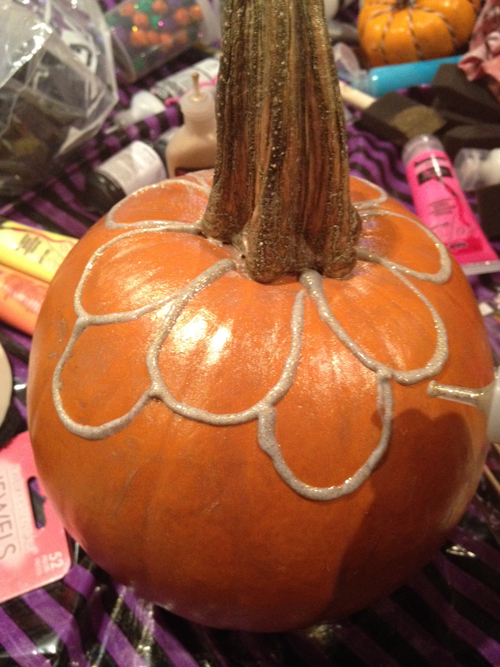 I love the way the glitter dries! 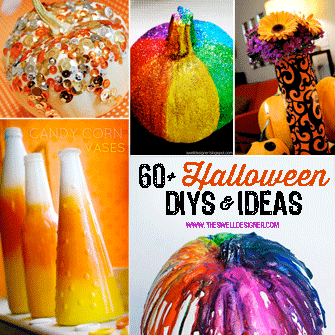 This is so easy and has an amazing impact on display. I think the tone on tone effect really works here! 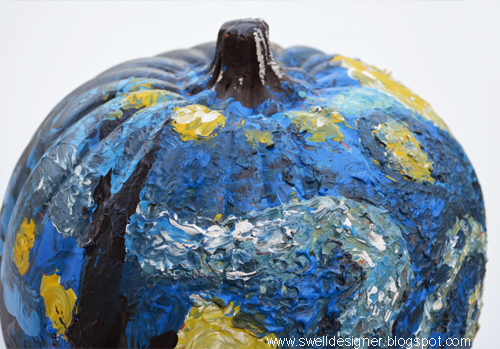 Today I am here with another fun pumpkin DIY, this one inspired by the iconic impressionist Vincent Van Gogh! 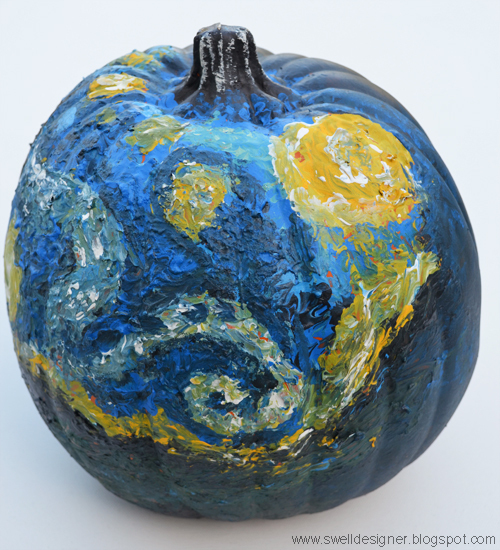 I’ve been wanting to make this pumpkin for the past two years, and I finally got my act together and made it happen and I’m pleased with the results, considering I’ve never thought I’ve had great painting skills. 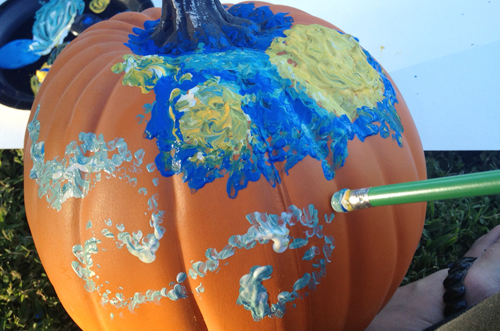 There is a little bit of a secret ingredient to getting this impressionist touch on a pumpkin…it’s the eraser on a pencil! Check out below how I made it! 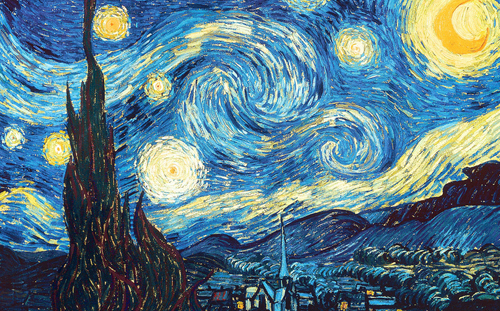 – an image of Starry Night printed out or on your phone (I referenced my phone throughout the project). 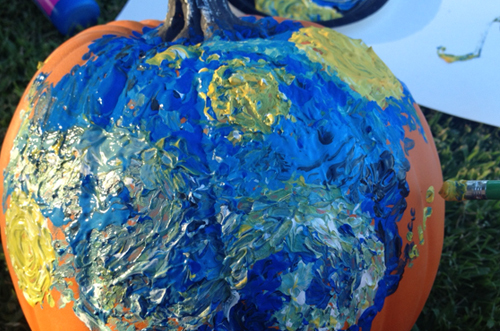 Note: There is really no one way to complete this pumpkin as far as painting goes. You can follow my steps below or branch out on your own if you think there’s a better option! 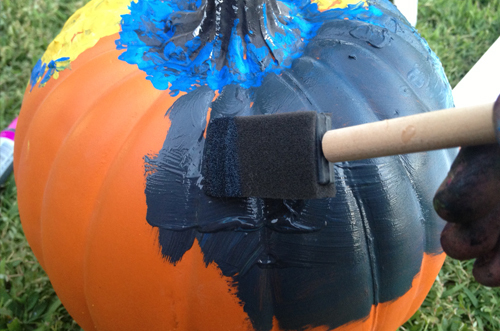 Also feel free to use a paintbrush or palette knife if you feel more comfortable using those. I chose to use the back end of a pencil, because I knew it would produce a messy impressionist paint look that I was going for. 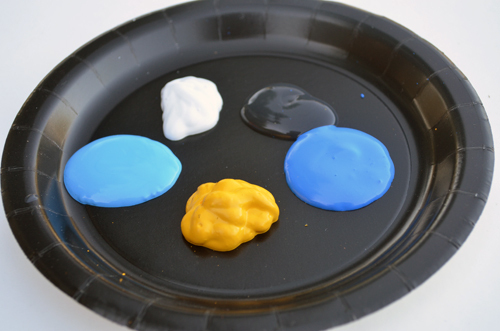 Start off by pouring some paint onto your plate. I recommend a bigger plate than this actually. By the time I was done, my “palette” was a hot mess of color and I didn’t have much room to make new colors. 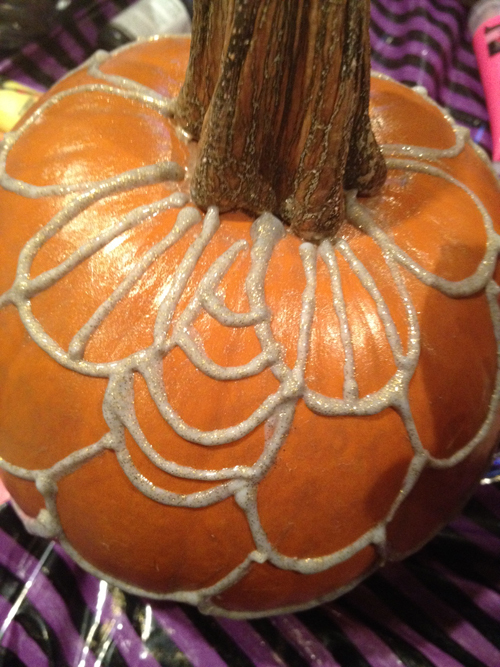 I started off by using the back end of the pencil to dot the top of the pumpkin. 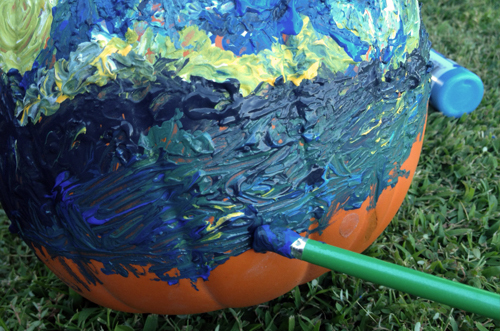 I left the stem black since that’s a natural color you would find in the painting’s landscape. I next mixed some a couple shades of yellow together and tried my hand at the sun. 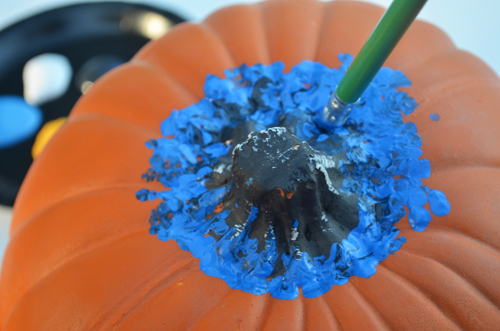 As you can see, the paint really sits off of the surface and has dimension using the eraser end. I next mapped out the appearance of my the swirl in the sky and dotted that on with light blue and white. 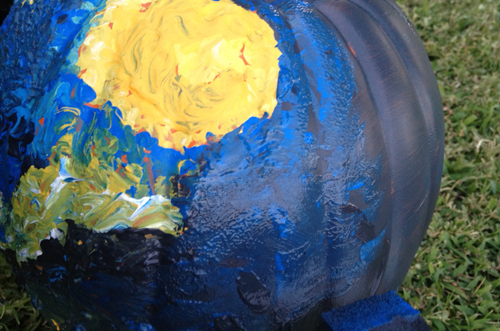 After that I started filling in around it and also made the sun at left. Next up was the job of making the tower as well as the dark city landscape. I mixed lots of darker colors together for this one with pops of streaks of yellow and white to suggest lights like you see in the original painting. 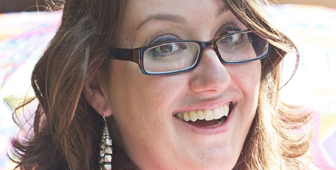 …then mottled in some blue tones to make it a little less harsh of a transition from front to back. 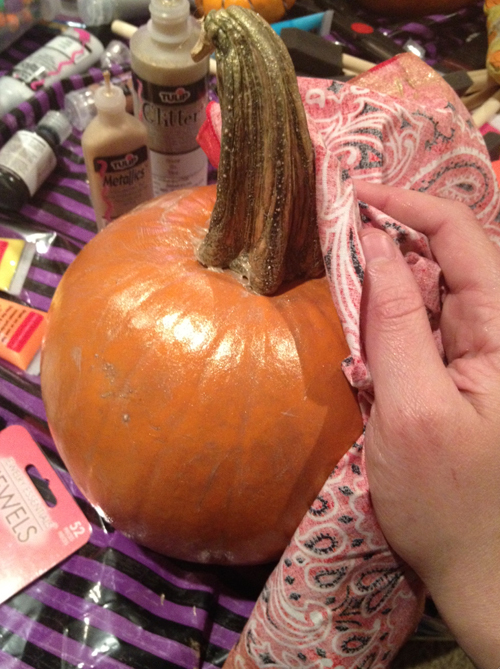 As you can tell, there’s a few orange spots poking through the color of the pumpkin. 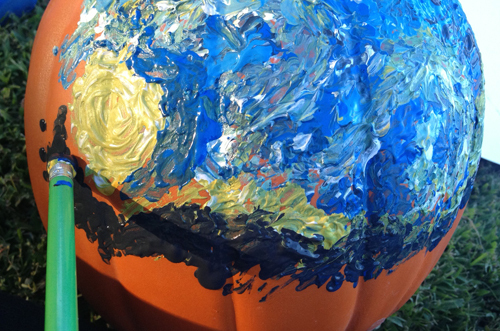 I’m actually ok with this, since it is a) a pumpkin and b) goes along with the impressionist look overall! 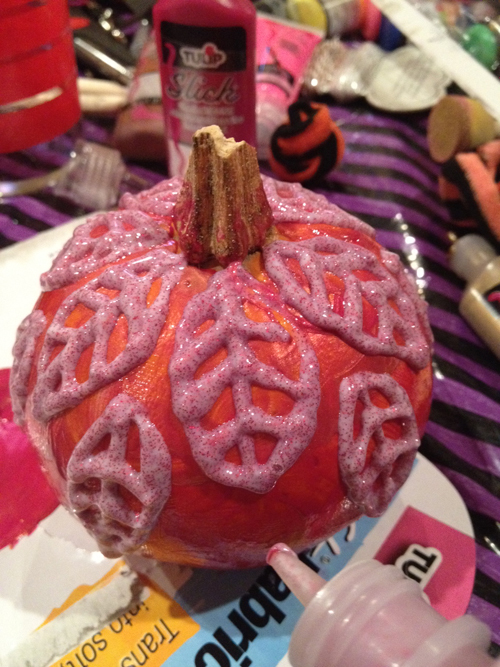 And here’s a couple more pics of how it turned out! And of course, Dexter had to chime in on his thoughts as well. 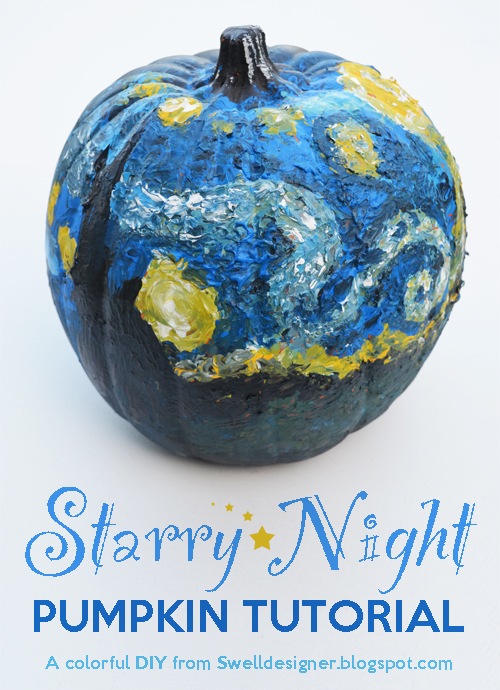 If you like this project, please check out my 30+ more inspirational pumpkin projects. As you can tell fall and Halloween are my most favorite times of the year!